Here's a recipe for those times when you need a low GI meal in a hurry. This pasta dish with an italian style tomato sauce is ready in 15 minutes and is a real help for all those short on time but looking to eat healthily or loose weight. Cut the onion into strips and add to a pan with the crushed garlic cloves and the olive oil. Fry the onion on a gentle heat for 2 minutes, stirring regularly. 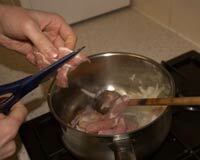 Meanwhile cut the rind off the bacon using scissors and then cut into strips and add to the pan. Also add the salt pepper and herbs and keep stirring to prevent sticking. 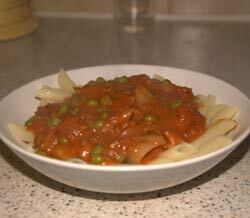 At the same time boil a kettle of water and prepare the pasta by following the instructions on the packet. 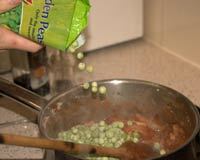 Add the frozen peas then cook for a further 4-5 minutes or until the peas are cooked. Serve on top of the cooked pasta.